Feedstuffs launches a newly redesigned and re-engineered website that features many enhancements and greater ease of use. This week, Feedstuffs launches a newly redesigned and re-engineered website that features many enhancements and offers a modern approach to the way you are able to interact with and view our content. Our new site adjusts on the go to switch between horizontal and vertical, tablet and phone, laptop and desktop. You will see virtually the same site and content, regardless of how you access it, with no drag on loading times. Our pages load much faster than in the past, so you can navigate, search and find the information you need more quickly. Navigating our new site has been simplified through the addition of a menu button in the upper left-hand side of the page. Click that button to see a selection of our most popular sections. Also, as you finish reading stories, you are now offered more content on related topics. Our market data offering has been improved to include the addition of localized cash grain bids and charting. You'll find a new and improved VFD Central to help you answer all your Veterinary Feed Directive questions. Feedstuffs FoodLink, previously a stand-alone website, can now be found on Feedstuffs.com as well. 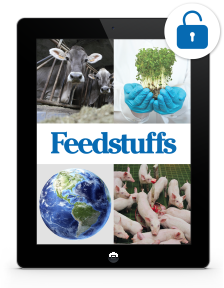 Finally, over the course of the next few months, you will be seeing a refreshed look for our Feedstuffs logo, print publications and e-newsletters. Thank you for being a valued reader of Feedstuffs. We welcome your feedback and will continue to improve the Feedstuffs website to make it work for you. Comments may be sent to sarah.muirhead@penton.com. To subscribe to Feedstuffs print and premium online content, visit https://circulation.feedstuffs.com/Publications.aspx. If you are already a subscriber, simply click on the login button on the top of the page.